Yesterday, I started reading one of the four books I bought last Friday in Book Sale. 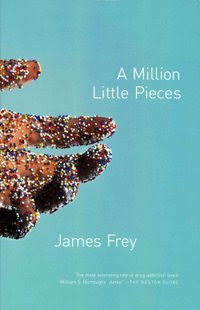 It’s the controversial memoir of James Frey. I still bought it even parts of it are fictional. Anyway, I’m done with the first 50 pages of this thick book. I was so used in reading Mitch Albom’s book that it made me think that it would take me a lot of time to finish this book. So far, the first 50 pages that I read were not boring. Wow! I just started reading M.A's Tuesdays with Morrie and am having fun reading it. This books seems very interesting, am still wait for HP 7 to be out on July. Maybe I'll check out this book next Saturday. Nice Blog!